↑ Lead Graffiti's Albion iron hand press was purchased in 1928 by the Carnegie Institute of Technology to print the massive 12-volume, 12" x 18" Frick Collection Catalogue. Lead Graffiti bought it in 2008. AS BOTH THE OLDEST AND LARGEST PRINT-SIZE presses in our studio, these two hand-powered machines will make you feel like you've really stepped back in time. As we are still in the learning stages of working with the iron hand press ourselves, we welcome your company to work along with us for the better part of a day. In 2018 our Albion celebrates it 90th birthday and our Washington #5 celebrates it 150th birthday. Wear comfortable shoes and work clothing. Dress for the weather : we are not air-conditioned, and in winter much of the heat wants to rise to the top of our 20-foot ceiling. Bring questions, your camera and a notebook to record your process. FOR 400 YEARS BEFORE CAST IRON came along in the early 1800s, hand presses were made almost entirely out of wood and changed very little technology-wise. This earned them the name of "common press." There were generally 2 operators, an inker and printer, as well. The printer kept his hands clean to handle the paper and operate the press mechanism. The inker did the dirtier work of inking the form by pouncing the face of the type with a pair of ink balls that were shaped something like boxing gloves with wooden handles. This workshop gives you an opportunity to print with 2 different iron hand presses of similar size. Built to order in 1928 in London for the Carnegie Institute of Technology in Pittsburgh, PA, this Albion iron hand press is one of a matched pair, which were among the last presses manufactured there. Harrild & Sons Albion—This custom-built British press is known as a super-royal in size. With a printing area of 21" x 29" and its honeycomb-style platen, it was destined for fine press book work. R. Hoe Washington #5—This iron handpress was built around 1869 and features a large platen / printing area of 25" x 38." The radiating ribs on top of the platen make it slightly lighter in weight, and thus supposedly a tad faster to operate. Its size lends it toward newspapers and book work, as well as broadsides. The photo below shows Jill and Ray during the restoration process for Lead Graffiti's Washington #5. The graphic below was taken from the cover of a leather-bound, Stanley Morrison book in our collection showing a printer pulling a wooden "common" press, but the process is the same and you look just as good pulling it. This press is a bit of a physical workout, but you are truly in touch with historical printing techniques. Above workshop participants examining the print quality of our first Albion print during our inaugural iron handpress workshop at Lead Graffiti. 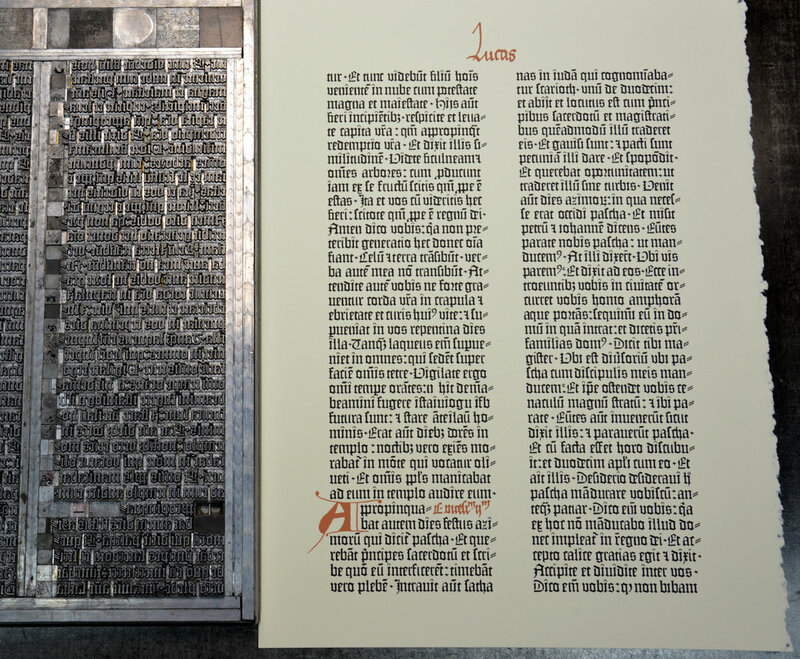 Above we have a sample page of Gutenberg's 36-line Bible set in reproduction movable, metal type. Below is a student handset piece printed on an Albion at Carnegie Institute of Technology in 1927. CIT bought the Albion we have in 1928 to print the Frick Collection Catalogue. We think typographically it is about as nice as anything we’ve ever seen. And it is done with handset metal type. And it was printed on an iron handpress. This would still be really hard on a computer if you knew were you were going. When working with handset metal type you would have to be constantly retrying various ways to get lines to come out evenly. Getting the sloping bottom of the text is killer hard. Notice the way the top 2 lines exactly fill the width of the page. And then the next two lines. How the type snugs up against that large initial letter. The work on the tailpiece at the bottom is very well constructed with the ever-narrowing measure. Simply a stunning piece of handset metal type. Below is the title page of the 12-volume, 12" x 18 page size Frick Collection Catalogue that our Harrild & Sons Albion was purchased to print.